Property consists of a wide, deep lot with two cabins with a small stream (trout) running across the front of the property. The larger cabin at 547 sq.ft. 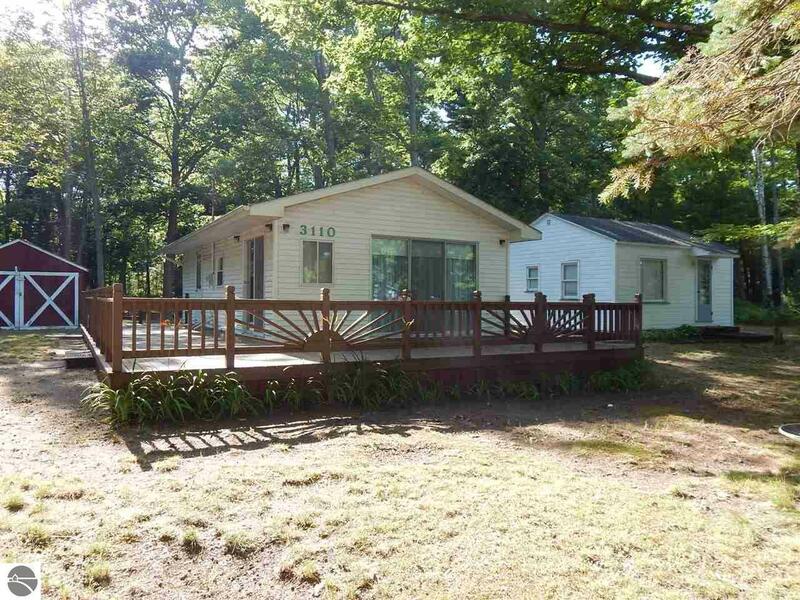 is nicely updated (1995) with wiring, vinyl siding and a 600+ sq.ft. deck. It features two bedrooms, a full bath and a 17x11 living and dining area. Natural gas is installed in the cabin if a natural gas heat source is desired. Also a washer is included and the area is set for substituting a stackable washer/dryer. The smaller cabin at 360 sq.ft. has a new roof and includes a 19x9 living and dining area, one bedroom and a full bath. Lake Huron access is just across the street and north just a few doors, also another larger access shortly to the south with parking. This makes a great family compound with lots of area outdoors for the kids to play, great lake access, and close to all the other outdoor activities in the Oscoda area. Or, use the larger cabin and rent out the small cabin by the week during the summer for extra income. Look this one over soon.